How do you really annoy someone in a supermarket checkout queue? 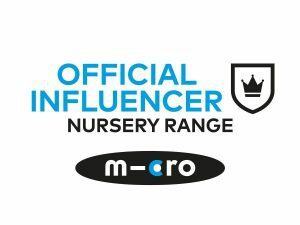 Put your toddler in a jumper that squeaks. It works wonders! I’m not even remotely upset that I annoyed this guy either as he was unloading his stuff onto the conveyor belt before my trolley was even empty, I was going as fast as I could with a baby in a carrier on my front and (squeaky!) toddler to entertain too! Oh the joys of shopping on pension day… anyway Athena’s jumper squeaks! Novelty jumpers are getting more and more popular, and not just at Christmas! Squeakyjumpers.com are selling them for kids and adults, but they’re not your average naff jumper. 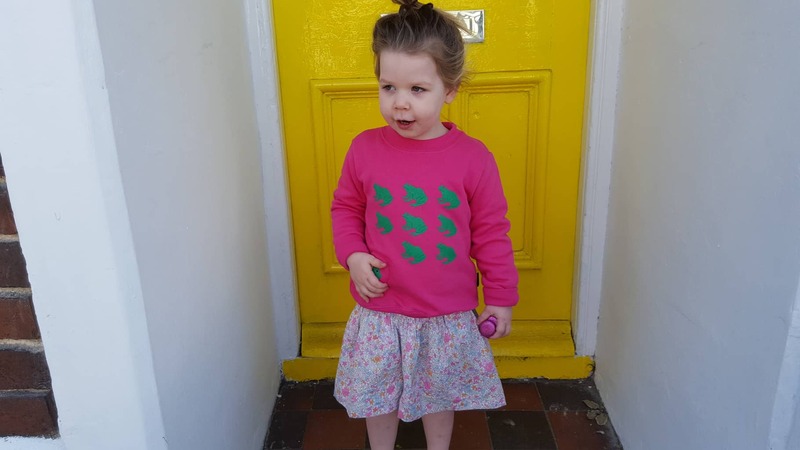 With a variety of fun and very bright animal designs, each jumper is equipped with its own squeaky animal! There are no batteries to change (or remove when washing) and you can pop the jumper in the wash just like normal which is a big bonus for me! 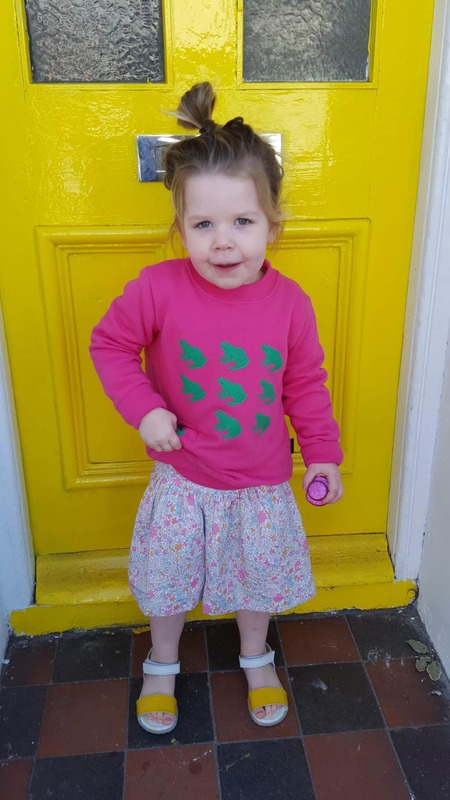 We didn’t tell Sam that the jumper had a squeak, and it took him a little while to work out where the squeaks were coming from on the first day she wore it! Its a fairly thick cotton-mix sweatshirt so perfect for layering or instead of a jacket in the summer evenings. All the styles are countryside inspired, are based on a vintage design from the 1980’s and are designed and MADE in the UK, which is a rarity these days! 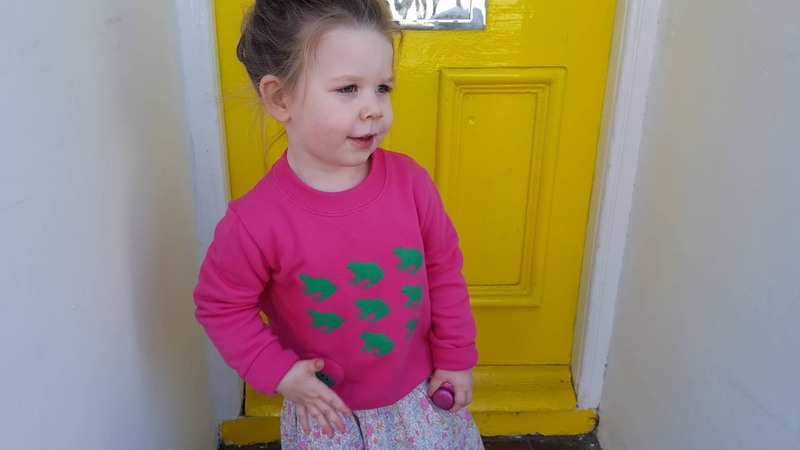 Athena is absolutely in love with her frog print jumper, and can be found squeaking it often, and jumping around as she does so! You can visit them on twitter & facebook to keep up to date with new styles. Thank you to Squeaky Jumpers for sending Athena this jumper, I’m so tempted to get one myself for a bit of mum/daughter twinning!